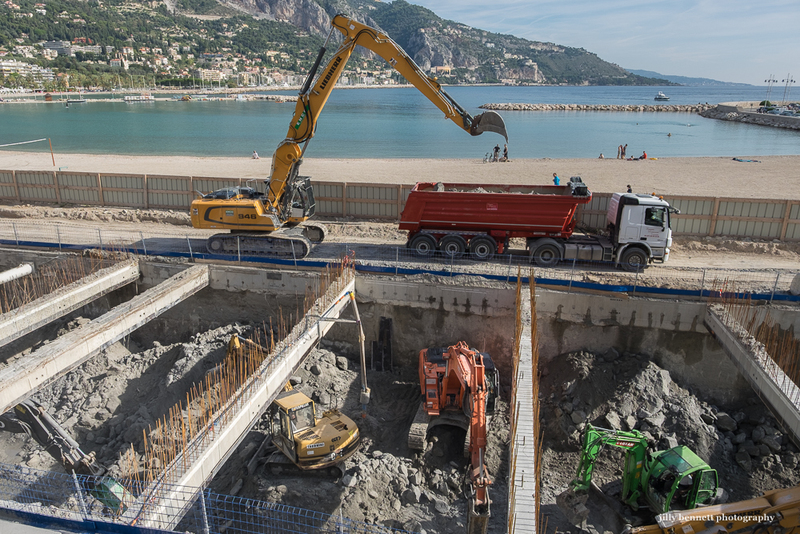 In the background, the Sablettes beach and in the foreground, work continues to remove rocks and soil to create a new underground car park. Like a lot of massive mechanical insects! Cars used to park here but when it's finished, the area will be arranged as a paved promenade with trees. Lots of noise and dust but with the promise of good things to come. Dans le fond, la plage des Sablettes et au premier plan, les travaux qui se poursuivent pour enlever roches et terre afin de construire un nouveau parc de stationnement souterrain. Comme beaucoup d'énormes insectes mécaniques! Avant les véhicules se garaient ici mais quand ce sera terminé, la zone sera aménagée en promenade pavée, avec des arbres. Beaucoup de bruit et de poussière mais avec la promesse de belles choses à venir. They do resemble that. Quite a backdrop! I've been watching the renovation of the Arch ground from my office window for more than a year. I wonder if these machines are insects or monsters, benevolent or threatening.